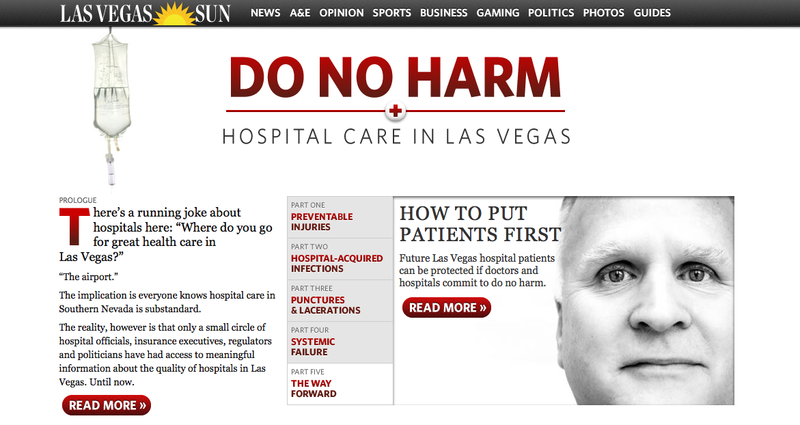 Las Vegas Blog: Steve Friess' VEGAS HAPPENS HERE: Another Pulitzer Nod Coming For Las Vegas Sun? Two years ago, most of Las Vegas was caught completely off guard when our little Las Vegas Sun snagged a Pulitzer Prize for public service for Ali Berzon's coverage of a rash of construction deaths at CityCenter. We weren't paying attention because the idea of a Vegas paper earning such an accolade was sort of hard to fathom. If anything, I would've expected the Sun's awesome cartoonist Mike Smith to win before anyone else. I also had thought that if Sen. John Ensign had resigned, Jon Ralston might stand a shot at a nod as a columnist. Well, I'm not going to get caught behind the curve this go-around. 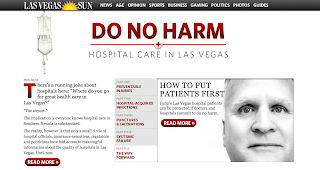 For the past couple years, the Sun's crack medical writer Marshall Allen has been digging and digging and digging into all sorts of scandal involving medical errors, hospital reporting practices and the like in the Do No Harm series. 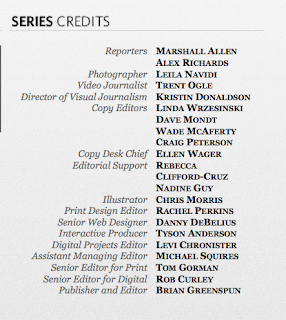 Marshall, like Berzon before him, is the main journalist here but as this credits box shows, it takes a lot of people to do such important and complicated work. Well, just like the Oscars have the SAG Awards and the Golden Globes, there are journalism equivalents and one is the Shorenstein Center on the Press, Politics and Public Policy's finalists for the 2011 Goldsmith Prize for Investigative Reporting, announced Friday. So look at that, Allen and co-writer Alex Richards are among the six for that. They're up against the LA Times for its investigation of corruption in Bell, Calif.,; NPR for an expose on the nation's bail bondsman industry; ProPublica and NPR (including Ira Glass) for coverage of the economy, the Washington Post for a look at the expansion of government since 9/11; and the San Jose Mercury-News on the influence of lobbyists in Sacramento. The nomination all but ensures that the Sun is looking at another Pulitzer contender and, frankly, just looking at the topics in contention I have to believe the odds are very good. The Goldsmith award will be handed out at Harvard University on March 7. The winner gets $25,000. 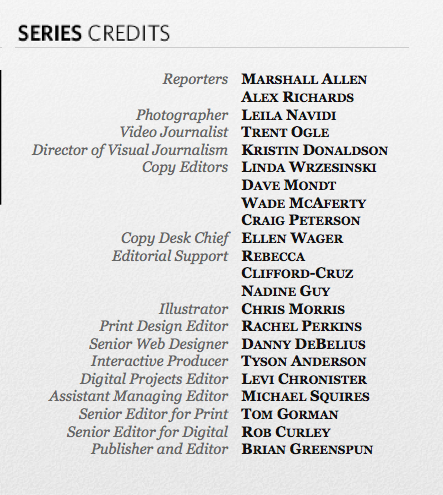 The Pulitzers are awarded in mid-April. Good luck!